J. R. R. Tolkien is, of course, the greatest writer of high fantasy, with a distinctive style that we fans love to read and re-read. 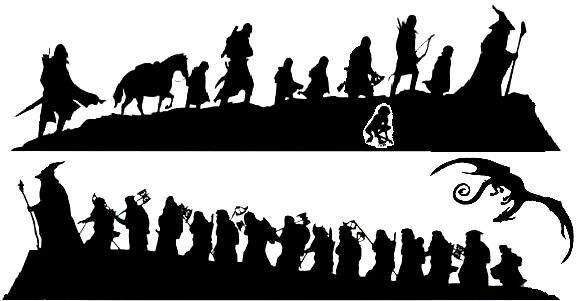 So it will be a mere Party Day amusement for you to tell us which of the following ten passages were written by the Prof.
For extra credit, can you name the works that Tolkien’s quotes come from? And can you name the other authors, and the works where their inferior quotes can be found? And yes, to be more than fair, I have limited the Tolkien quotes to The Hobbit, The Lord of the Rings, The Silmarillion, and Unfinished Tales. To be less than fair, I have edited out all proper names as they tend to give the game away too easily! 1. Now the lightnings increased and slew men upon the hills, and in the fields, and in the streets of the city; and a fiery bolt smote the dome of the Temple and shore it asunder, and it was wreathed in flame. But the Temple itself was unshaken. 2. And lo! the sunrise coming up from the echoes, and the plains new-lit by the day, and the leagues spinning by like water flung from a top, and that gay companion, the loudly laughing wind, and men and the fears of men and their little cities; and, after that, great rivers and waste spaces and huge new hills, and then new lands beyond them, and more cities of men, and always the old companion, the glorious wind. 3. Soon the wood grew very thick of pine-trees, though there was no undergrowth, so that when the sun sank it grew dark very speedily; but he still rode on in the dusk, and there were but few wild things, and those mostly voiceless, in the wood, and it was without wind and very still. 4. The host came over the northern hills where the height was greatest and the watch least vigilant, and it came at night upon a time of festival, when all the people were upon the walls to await the rising sun, and sing their songs at its uplifting; for the morrow was the great feast that they named the Gates of Summer. But the red light mounted the hills in the north and not in the east; and there was no stay in the advance of the foe until they were beneath the very walls, and the city was beleaguered without hope. 5. The ruins of the Iron Tower smoking to the sky, and the torn and tumbled masses of masonry about it, showed monstrous in the gloom as fragments of old chaos; and from them and from the riven earth beneath steamed up pungent fumes as of brimstone burning. Ever busily, back and forth through those sulphurous vapours, obscene birds of the night flitted a weary round, and bats on leathern wing, fitfully and dimly seen in the uncertain mirk, save when their passage brought them dark against the moon. 6. From the cleft a path led, and passed soon into a little grove of dwarfed birches growing about a clear pool in a rock-hewn basin. This pool was fed by a spring at the foot of the wall behind, and through a runnel it spilled like a white thread over the western brink of the shelf. Behind the screen of the trees near the spring, between two tall buttresses of rock there was a cave. No more than a shallow grot it looked, with a low broken arch; but further in it had been deepened and bored far under the hill. 7. “My Ring!” he whispered in terrible exultation. “My power!” How long he crouched over the baleful thing, motionless as a statue, drinking the evil aura of it into his soul, not even he himself knew. 8. Many were the pillars of the palaces, all of tinted marble, and carven into designs of surpassing beauty. And in most of the palaces the floors were mosaics of beryl and lapis-lazuli and sardonyx and carbuncle and other choice materials, so disposed that the beholder might fancy himself walking over beds of the rarest flowers. 9. Nothing could he see there, save at the eastern end a high seat upon a dais, and softly as he might he paced towards it; but the sound of his feet rang upon the paved floor as the steps of doom, and echoes ran before him along the pillared aisles. As he stood before the great chair in the gloom, and saw that it was hewn of a single stone and written with strange signs, the sinking sun drew level with a high window under the westward gable, and a shaft of light smote the wall before him, and glittered as it were upon burnished metal. 10. Now as the light faded the wreaths of smoke which hung over the distant Fire-mountain began to glow luridly. Redder and more angry did they become while the darkness gathered, till at length they seemed to be charged with pulsing sheets of flame propelled from the womb of the volcano, which threw piercing beams of light through the eye of the giant loop that crowned its brow. No, no, no. You only look at the answers after you’ve tried to do the quiz! 3. The Well at World’s End, by William Morris, 1896. Thanks for playing! And thanks, TORn, for all the wonderful ways you’ve given this community so much pleasure over 19 years. The only one I recognize is 4, the attack on Gondolin. Random guesses: 1 is Biblical, 2 is George Macdonald, 3 is Sleeping Beauty...??? I will make a fool of myself and paste my guesses here. I do not have the ability to recognize Tolkien or other writers by their language, and my guesses are based only on recognition of situations from Tolkien stories. It will have to do though. 1. Tolkien, Silmarillion, well Akallabeth if we are been technical! 2. Not Tolkien! And I don't even know who. Is it the Bible? 5. Not Tolkien. I will guess Stephen King's dark tower! 7. No chance is it Tolkien. Looks a bit like Dr Who, actually! 8. I don't think it is Tolkien, but whoever it is likes his or her flowers! What is a lapis-lazuli anyway? 9. Tolkien, though I am guessing a bit here, I don't recognize it so I will guess unfinished tales, which I don't know all that well. 10.I don't think Tolkien, so I will guess George. R. Martin as I suspect that one will be from Game of Thrones! That was a bit hard! Oh Geez! I took a shot at it... and cringed at my WILD misses! That's Wikipedia's description. Not a word Tolkien used in his mature fantasy writing, as far as I can recall, but one he might have used in earlier works. Treason doth neuer prosper? What's the Reason? for if it prosper none dare call it treason. Discuss Tolkien's life and works in the Reading Room! How to find old Reading Room discussions. You tripped me up by mentioning The Hobbit and The Lord of the Rings in your quiz description but not actually including anything from those books. I identified #1, #4, and #9 right away, and while I was pretty sure #6 was Tolkien, I couldn't identify the source: it's almost a description of Treebeard's house with a few details changed. Children of Hurin, huh? Mim's place in Amon Rudh, perhaps? You got me with #3, a Morris passage that I guessed to be from Unfinished Tales. The others I knew were not Tolkien (or at least not from the list of possible works you provided), but I don't know other fantasy literature well enough to have identified them without your answer key. Nice find with #7, clearly not Tolkien and yet with a strikingly Tolkienesque theme! I missed no. 9, and had doubts about no. 6 - but picked it anyway, as i felt there should be more than two, and it seemed the most likely. None of the non-Tolkien passages fooled me, though some seemed similar. But then I checked squire's answers and found out that it was published in 1932! Numbers 5, 7 (that description is a bit much, even for Gollum), and 8; and the scene from No. 10 I couldn't place anywhere in Middle-earth. I agree with NEB, no. 6 sounds almost like a description of Treebeard's home! But I was unable to place any of the quotes in the works they came from. An interesting challenge, squire, thank you! I notice you kept a certain author's works out of this, it would have been compelling for a comparison.